We may owe The New York Times an apology. Navy and other American intelligence analysts surmise that the vessel, which Fifth Fleet wags have nicknamed the Target Barge, is something that Iran could tow to sea, anchor and blow up — while filming the whole thing to make a propaganda point, if, say, the talks with the Western powers over Iran’s nuclear program go south. We surmised that the US intelligence officials were either unaware of the real story or winding up the Times reporter: Iranian media had long said that the model ship was for an Iranian-Canadian film, including Val Kilmer and director Oliver Stone’s son Sean Ali. But on Friday the Times story got some support — and it came from an Iranian, rather than American, source. 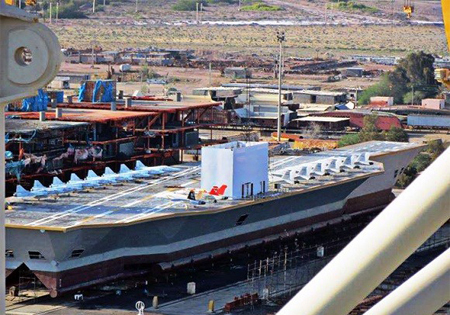 The naval commander of the Islamic Revolutionary Guards Corps, General Ali Fadavi, said the mock aircraft carrier and its mock warplanes were for joint training exercises with the Revolutionary Guards’ Aerospace Forces, as well as Naval and Air Forces. Fadavi noted reports in the Western media but — even though he had effectively resurrected them — said “the news and analysis had no basis”. He said the exercises would prepare Iran’s military for “the event of a real war”. However, Fadavi did not reveal if his troops were going to blow up the ship. PreviousSyria Mystery: Did Insurgents Capture a Regime “Chemical Weapons” Base?